Occupy protestors in bid to shape housing policy: Occupy London activists, under threat of eviction themselves, are mooting their own proposals on housing policy to put to government. Giving Community Groups A Chance To Revive Their Neighbourhoods: New empty homes community grants programme launched. Potentially up to £30million for community groups. Phoenix Housing co-op are an example of community groups who could make good use of above-mentioned grants. It’s Landlords Not Tenants Getting Rich on Benefit Payments: We knew as much. Buy-to-let owners raking in the Housing Benefit. The Great British Property Scandal: Watch the vids, the TV show, join the debate. Copenhagen’s Christiania community are attempting to buy their properties, selling shares. Reports and eyewitness accounts of police brutality during Pinheirinho Eviction, Brasil. Blog in Potuguese here. Co-op housing is still a very small part of the housing sector here in the UK, apparently 0.6% of housing stock. It’s a different story in the rest of Europe though where there are more than 10 million co-op homes. So, what is a housing co-op? The Confederation of Co-operative Housing say ‘they are the country’s best kept secret’. Basically, a group of people can become a co-op (on paper, so to speak) then find and buy a property to make their home. They buy a place and live in it together sharing the costs and responsibilities. BUT the mortgage on a co-op is more like a corporate loan than an individual’s mortgage. The co-op is a legal entity much like a business or charity which means the mortgage is taken out in the co-op’s name not in the names of the individuals. My experience has been with FULLY MUTUAL housing co-ops. Fully mutual co-ops own, manage and control their property(s), all tenants are members of the co-op and are (have a right to be, at least) involved in the co-op. These types of independent housing co-ops are owned and run by the tenants, those who live there are collectively responsible for financial decisions and membership. Being an independent co-op means as members/tenants YOU have control over your home. No landlord, no mortgage, no unexpected unreasonable rent rises. You, collectively, can decide on the rent, even how much it is and where it is spent. Obviously mortgage/loan repayments have to be covered so the rent is calculated to cover everyone’s share of expenses, to keep the co-op ticking over. You elect a committee of management – at least a Chair, a Treasurer, and a Secretary, and sometimes hire contractors or outside agencies for accounting, admin or maintenance work. More on this over the next weeks. I’ll be asking can housing co-ops be (a part of) the solution to affordable housing and the housing crisis? How could families, particularly low-income families, do co-op housing? Coincidently, today sees the launch of the International Year of Cooperatives – will housing be highlighted or will it all be about business? Squatting is a common housing alternative, with an estimated 15000 to 17000 squatters in the UK and a billion squatters worldwide. Squatting is legal in England and Wales and squatters have certain rights. The government is looking to make it a criminal offence. You can, until October 5th, respond to the consultation here. Squatters don’t steal your home. That’s a criminal offence. They tend to occupy uninhabited places, empty, unused, abandoned buildings. Squatters often improve the properties they occupy. See Squat Or Rot for examples. Tens of thousands of otherwise homeless people in the UK are self-homed by squatting. Different people squat for different reasons. For some it’s a necessity, or an opportunity. Most are victims of housing policy and the housing crisis, others victims of natural disaster or war. And for others it’s a political act, people often bring empty buildings back into use as social centres or community spaces. Every continent has squatters. See Squattercity for a good few examples. Ex-servicemen and women started a squatting movement and campaign in post war England, occupying hotels and empty blocks. Squatters were at the forefront of the 1970s movement for more co-operative housing, many groups of squatters formed permanent co-ops. Does mainstream media demonise squatters? This says what I’ve been saying here, it mentions eviction statistics, housing co-ops, the threat to squatting, but goes further and suggests a need to build a housing movement. It’s over at Red Pepper, which actually has a good housing section. Well it looks like the authorities are genuinely considering making squatting illegal. It won’t happen without some real resistance though. Follow Squash campaign to keep up with the government consultation, apparently not the first time a Conservative government has tried to criminalise squatting. A few weeks ago a small army of police blocked off Brixton’s Coldharbour Lane and evicted Clifton Mansions which has been squatted since the early 1990s. Schnews have something to say, as you’d expect, pointing out that it could be expensive for the State because many people kicked out of squats will inevitably have to start claiming housing benefits! louderthanwar.com suggests squat culture has been the backbone of creativity for years. It’s not just about squatting, criminalising trespass will make life more difficult for travellers too, as pointed out by Guardian Legal Network. Dale Farm, the biggest travellers community in the country is under threat of mass eviction. They are having a weekend gathering on Saturday August 27th. Squattercity blog has come back to life somewhat, always a good read there. A Channel 4 series coming later this year about empty homes and housing inequality. It’s rare but it does happen – the mainstream media covers housing co-ops. Let’s be clear, it is extremely unlikely your house will be squatted while you are away on holiday. No, squatters do not go around casing other people’s homes to steal. The whole point for the vast majority of squatters, and I think we can presume it’s the same across the world, is to make use of property that has been left to waste, temporarily bringing a long term abandoned building back to life as a home. Recycling on a grand scale. And not all squatters are dreadlocked crusties or radical anarchists, despite media portrayals of Europe’s main cities. 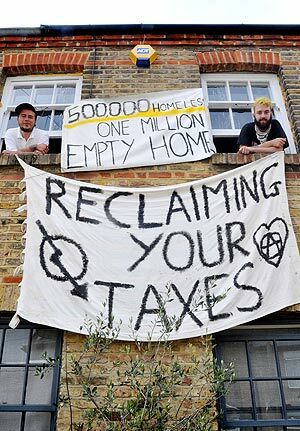 Squatters are basically people who have taken things into their own hands, most are simply victims of a global economic system that creates a housing crisis. Different people squat for different reasons, generally out of necessity, often because of homelessness through poverty or natural disasters, or unnatural disasters like war zones. Many who were previously not squatters now are and will be for the foreseeable future’. There are thousands of people squatting in New Orleans since hurricane Katrina ravaged their city, millions of internally displaced earthquake survivors squatting in Haiti, entire squatter villages in some parts of the world. Every continent has squatters. Heard of the favelas? Dharavi? Grande Hotel Beira? The shackdwellers movement Abahlali baseMjondolo? Last month, the Daily Fail started something, the Independent joined in with their ‘anarchist collectives living rent-free in Georgian townhouses‘, and the Torygraph took it upon themselves to campaign for a change in the law, and Grant Shapps the Housing minister took it up. Now they are looking to make squatting a criminal offence, a crime, in England and Wales. It already is in Scotland. The Advisory Service for Squatters replied with an open letter to the Daily Mail. The Washington Post had a piece (last year), a tad more balanced than the Mail and Telegraph, the feature ‘Recession Revives Britain’s Squatter Movement’ sees a rise in squatting ‘as a barometer of the times’, and makes the still relevant and important point that ‘home repossessions soared … to about 45,000 last year and could reach 75,000 this year, creating new homeless people and new empty houses’. Under current law squatting is not a criminal offence. It is a civil matter, if a property owner wants to get squatters out they have to take it to court. Squatters have certain rights. And so they should have. Squatters are caretakers and home-makers, they make homes out of buildings that more often than not have been left to rot, needlessly, sometimes intentionally, some houses are simply bricks-n-mortar investments sitting til a profit can be made. Why do they want to turn the homeless into criminals for helping themselves rather than making it a crime to create homelessness, empty homes and perpetuate the shortage of decent affordable housing? Or is it more of a reaction to activists cleverly ‘reclaiming the dead investment space of the wealthy‘? Because it’s not just about homes for the homeless. There is a history of abandoned buildings like schools, libraries, swimming baths, shops, even old police stations and jobcentres being put to good use by and for local communities. What Scotland lacks thanks to it’s law criminalising squatting, we notice, is free spaces and real community centres or social centres. Free as in gratis, and free as in non-commercial. As the cuts kick in and public services are reduced we might see more empty edifices ready to be turned into positive community spaces. I’m going to explore housing alternatives. Really explore them. 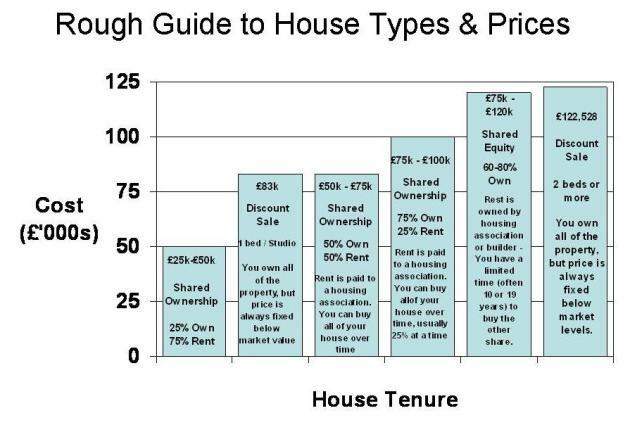 Initially it’s an effort to gain a better understanding of the apparent housing crisis and to get a bigger picture of housing options here in the UK, but I am also going to take a good look at the alternatives to renting or getting mortgaged to the gills. There are so many different ways of living and a good few interpretations of what a ‘home’ actually is. From council housing to cohousing, cooperatives, squatting, semi-mobile homes, live-in vehicles, self-build, to whatever else I find, I’ll explore as many alternatives as possible. From common supposedly available-to-anyone urban housing to more radical examples of human shelter. I’ll most likely spend my efforts looking into ‘positive’ alternatives but then again I may well touch on homelessness, refugee camps, tent cities, survivalism. My explorations will undoubtedly even take me beyond the northern hemisphere! You see, with a mortgage you don’t even actually own your home, do you? It belongs to the bank, ultimately. And renting is just topping up someone else’s bank balance or property portfolio, isn’t it? Either of these two most common ways of securing a roof over your head are, for the majority of people, really only paying through the nose to keep bankers and property owners in piles of cash, aren’t they? So what’s the alternative? Well, we’ll see. Squatters take over Colonel Gaddafi’s son’s £11m London mansion. And a bit of post-war, that’s late 1940s, film of squatters protesting housing shortages in Britain: HOME FRONT SQUATTERS. I read that public housing has become a ‘tarnished state project, so stigmatised in the public’s view’. Well if you think council housing has a bad name, then consider most people’s attitude to squatting. The mere mention of it sends middle England completely potty. Taking over abandoned empty buildings to make a home is actually quite a common, if mostly temporary, housing solution for millions of people around the world. According to Advisory Service for Squatters there are at least 20,000 squatters in England and Wales, although in Scotland it’s a criminal offence. Even the president of Venezuela Hugo Chavez has recommended it, encouraging poor Venezuelans to occupy disused land apparently ‘prompting a wave of squats that is rattling Venezuela’s middle class.’ Chavez is definitely on to something when he claims the rich keep all the best land, often leaving it sitting unused. Cities for the rich suggests the same; poorer households are displaced by higher-income households and property investors, also known as gentrification. Squatting 4 Dummys suggests squatting, or housing liberation as they term it, can be a force for positive change, ‘especially one rooted in its neighborhood community’. 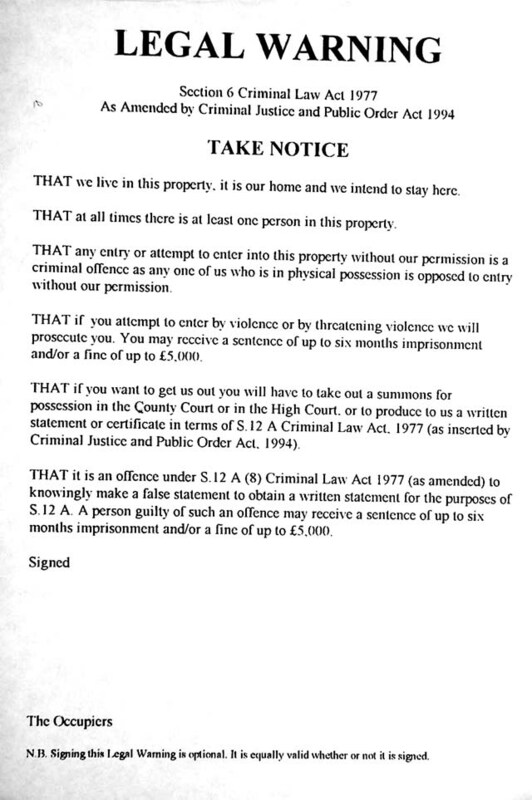 An example in Bristol of successful resistance to eviction against infamous bailiffs Constant & Co. (For more on these ‘gypsy eviction specialists’ read this and this). And this: homeless evicted from former homeless advice centre. In France a group have occupied a building in upmarket Paris. And recently a London group reclaimed a Grade I listed building in central London. So previously we were talking about the housing crisis. What? Yes, I know it’s been a while. Excuse the hiatus. Anyway, one thing to note is that there are in fact plenty of empty properties, in some places as many or even more unused homes as there are people in need of a home. It seems more attention is now being paid to the potential of empty properties as part of the solution to the crisis in housing. The Empty Homes agency is somewhere you can report buildings you know of going to waste in your area. You post the location on the site and the relevant local council is informed. Then the council supposedly make an effort to get the empty properties back into use. Sounds good. Probably quite straight forward if the property belongs to the council, but what if it’s abandoned private property? What powers do councils have to encourage property owners not to let buildings sit empty? Well local authorities are actually required by law to seek out empty homes. There are grants and loans to help owners make their empty property available, and ultimately councils have Empty Dwelling Management Orders and even Compulsory Purchase and Enforced Sale. Local authorities in Scotland may get new powers to increase council tax on long-term empty homes. Today (Tues 8th Feb) the Guardian’s Housing Network Blog hosts a live Q&A on funding and the changes in council housing.